Connect with Soul and Give up your Dieting Woes for Good! When Kate seeks help for her yo-yo dieting and weight gain, she’s looking for more than just another carb counting quick fix. Tired of both herself and an endless parade of nutrition and fitness advice, Kate doubts that any diet can help her overcome her compulsive eating habits to find the perfect weight. A warm-hearted and fiercely direct dialogue ensues, as the two women clear Kate’s kitchen, asses her wardrobe and uncover a brilliantly confident woman that Kate never realized was hiding under her own skin. Join Kate on her journey from “I’m not” to “I am!” by receiving one installment of the story each morning for 30 days, accompanied by daily exercises and meditations to integrate Kate’s discoveries into your own life. Accompanied by Kate, the path to health and radiance has never been more engaging or appealing. Sign up now, and you’ll receive a month of teleconferences with Maureen, plus unlimited access to her via email, Free! Quit a diet that you swore you’d stick to, feeling defeated and self-loathing. Triumphantly reached your dieting goals, only to yo-yo back to your original weight, while frantically trying to control your fluctuating waistline. Felt frustrated and confused by the hundreds of diet “plans” and “experts” all with their own, often-contradictory methods of achieving the perfect body. Grown sick of listening to other people tell you how you should eat, exercise and look. 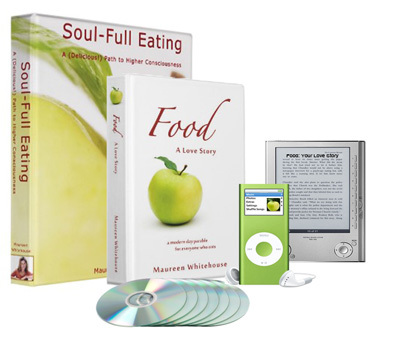 What if you could end all of your struggles with food and stop dieting forever? Most traditional diets rely on pre-planned meals, regimented lists of “shoulds” and “shoudln’ts”, and carb, fat and calorie counting—methods which only create more guilt and mealtime stress, and often causing dieters to quit altogether or quickly bounce back to their original weight. Kate’s Awakening, by contrast, tackles mealtime and dressing room woes at their very source—the deep-rooted feelings of guilt and self-loathing that most of us associate with those experiences—and which keep us from trusting ourselves to decide when, what, and how much we should eat. Over the course of this 30-Day email program, you’ll learn to trust yourself to make healthy, wholesome decisions about food. You’ll learn how to indulge without guilt, to eat when you’re hungry and stop when you’re full, and to eat—and live—in a way that leaves you feeling satisfied, and not aching for more. Expect your newfound confidence and appreciation to expand into the rest of your daily experience—get ready to love your life! are so entwined that we cannot think of one without the other. At first, my motivation to become supremely knowledgeable about nutrition and wellness was entirely self-serving and superficial. As an international model, I wanted to be “picture perfect” and “marketable,” so I could be successful and make a living. But as I watched friends and co-workers turn towards drugs or develop eating disorders, I realized that my interest in full-body wellness and spirituality had helped me not only maintain a desirable physique, but also stay sane in an often crazy and self-destructive industry. No matter how learned, how many degrees or titles someone may have after their name, the person who is most expert about you, is you! In fact, the more I came to know myself, the more evident it became to me how ludicrous it is that any expert should be given the authority to tell me, or any one, what precisely I should eat, at any given time of the day! I am not here to tell you that this food is good and this food is bad. It’s time to rise above all of that, and allow you to pay attention to your own body and your own needs, to give you the space to decide what is right for you, right now. Despite a world littered with fast food restaurants and seductive junk food commercials promising ultimate satisfaction there are people who are able to stay thin and healthy and can negotiate their way through the synthetic food jungle every day. And even quite peacefully and consciously indulge from time to time. How? They are focused on self-love, and have learned what satisfies their own needs, rather than endlessly filling a void and riding the cycle of self-guilt. Have you ever watched a small child eat? They eat what they want when they want it, and stop as soon as they are full. They never binge or intentionally starve themselves, or feel guilt for not eating the “right” amounts of the “right” foods. That is, until the child begins school, where there are allotted times for eating, and using the bathroom, and playing, and paying attention. At dinnertime, adults tell her that she has to either finish everything on her plate or stop eating so much of certain foods. As the child grows older, she loses touch with what her body needs, instead relying on experts to tell her what will make her feel and look “perfect.” She might overindulge to ease emotional pain, or restrict herself to feel more in control of her life and image. Soon, mealtime becomes a complicated mess of “shoulds,” “don’ts” and “wants.” Wouldn’t it be nice to return to those childhood eating habits, when you just ate whatever you liked, whenever you felt hungry, with no guilt? In this 30-day “non-diet” program, you’ll purge yourself of mealtime baggage, and learn to trust yourself to make healthy, wholesome decisions about food. You’ll learn how to indulge without guilt, to eat when you’re hungry and stop when you’re full, and to eat—and live—in a way that leaves you feeling satisfied, and not aching for more. Sure we can quiet that voice, from time to time, just like our body’s hunger for food, making it subside by burying it under layers of material consumption. But the only time that any of us are ever truly, deeply full, contented and satisfied is when we feel deeply loved. That void is the voice of your Soul calling you to live your own life fully and freely, led by a deeply fulfilling interior motivation that is aligned with self-love and awareness. A life guided by, infused with, and impassioned by love. Wouldn’t you much rather learn to love yourself than temporarily trim your waistline by mastering another diet, only to find yourself yo-yo right back to where you were before you started it? It’s the journey to rediscover Soul via the love of food.